This is my last Ilish Mach recipe for this season. Ilish mach is a kind of fish, whose no part should be waste. And if you are a hilsa fan, then you must know, Ilish machher matha, can be paired with anything, like many people make dal with ilish machher matha, can be cooked with pui shaak or malabar spinach, kochur loti or taro stem, bandhakopi or cabbage and even with misti kumro or pumpkin. You can even make sweet n sour Bengali tok with Ilish macher matha and tamarind paste. Today I'm going to share Ilish Machher Matha Die Pui Shaaker Chenchra recipe with you, which is similar with the rohu/katla fish head mishmash with pui shaak, but little twist at the end of ilish machher mathar chenchra. As we add sorse & kancha lonka bata at the end of the mishmash to give it a rich and hot flavor. 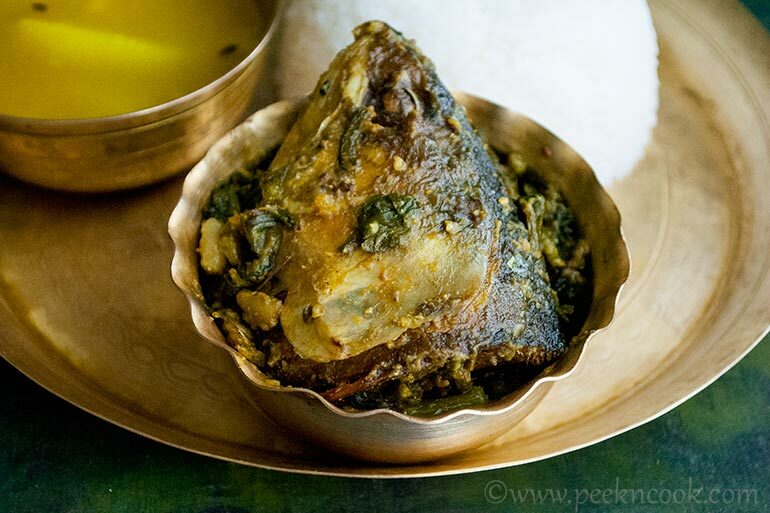 Today I'm going to share Ilish Machher Matha Die Pui Shaaker Chenchra recipe with you, which is similar with the rohu/katla fish head mishmash with pui shaak. As we add sorse & kancha lonka bata at the end of the mishmash to give it a rich and hot flavor. Take the fish head, clean and wash under tap water. Put them on a plate, add turmeric powder & salt and marinate the fish heads nicely. Now heat oil in a wok, fry the marinated fish heads till golden brown and keep aside. In the same oil, add panch foron and whole red chili to temper the oil. Fry for a while till a nice aroma comes from the panch foron, add the chopped vegetables. Add some salt and fry them till they look lightly fried. In the meantime rinse the malabar spinah or pui shaak. Discard the soaked water. Add the pui shaak to the wok, and mix everything gently. Now cover the wok, lower the heat and let everything cook for 5 minutes with its own water. Don't add water to the mishmash. After 5 minutes open the lid and add the fried fish head. Cover again for 2 minutes. After 2 minutes check if the vegetables are cooked enough or not. If they are cooked enough then higher the heat and let all the excess water evaporate and fry everything till a fried aroma comes from the mishmash. If the vegetables are not cooked enough, then add little water and cover the wok for another 3,4 minutes. After 3,4 minutes open the lid, higher the heat and let all the excess water evaporate and fry everything till a fried aroma comes from the mishmash. Now add the mustard paste and green chili paste to the mishmash and give it a gentle stir and turn off the heat. Let it be undisturbed for 5 more mnutes. Serve Ilish Macher Mathar Chenchra with hot steamed rice accompanied with any Bengali dal. Serve chenchra with hot steamed rice and any kind of Bengali dal. Don't add onion or garlic, it'll ruin the flavor of hilsa.